Who doesn't love a good pair of figure flattering super skinny jeans! 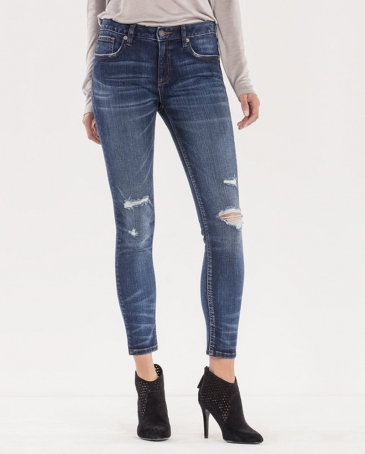 This ankle super skinny jean is detailed with distressing throughout, fading, whiskering, 5-pocket design, minimal hardware, and mid-rise waist. 88% Cotton; 10% Polyester; 2% Elastane Machine Wash Separately In Cold Water With Like Colors Front Rise: 8 1/2" ; Back Rise: 13 1/4" Inseam: 27"